I just love getting to pull a completed quilt off the frame! I washed and dried it today so now it is ready for binding. This quilt top started out as a Breakfast Club project, a fat quarter pattern called "Perfect Ten." From the start I envisioned quilting each little section with a different quilt pattern. There are 10 fat quarters for this pattern so I came up with 10 different fills for each fabric box...keeping with the same fill for a particular fabric...more practice at perfecting my fill options. Sew much fun...I'm going to have to do some more practice quilts to work on my "fill" options. Also pecking away at my patriotic log cabin quilt. We've been spending most evenings in the sewing studio since I have a fenced dog run outside my studio door. We have a few black bears that are regularly coming through the yard now and since evenings are the time we see them the most I have moved to the studio after 7 p.m. Sorry...no pictures....two dogs, barking their most ferocious snarls, are keeping the bears out of good photographic distance. Thought I would share a little "Alasakana." When the snow melts it is prime time to hunt for antler sheds. Artists purchase them for carving. Usually you find one side of a pair of sheds...then walk around a bit...and if you are lucky you find the other half. It is rare to find a skull with the antlers intact. 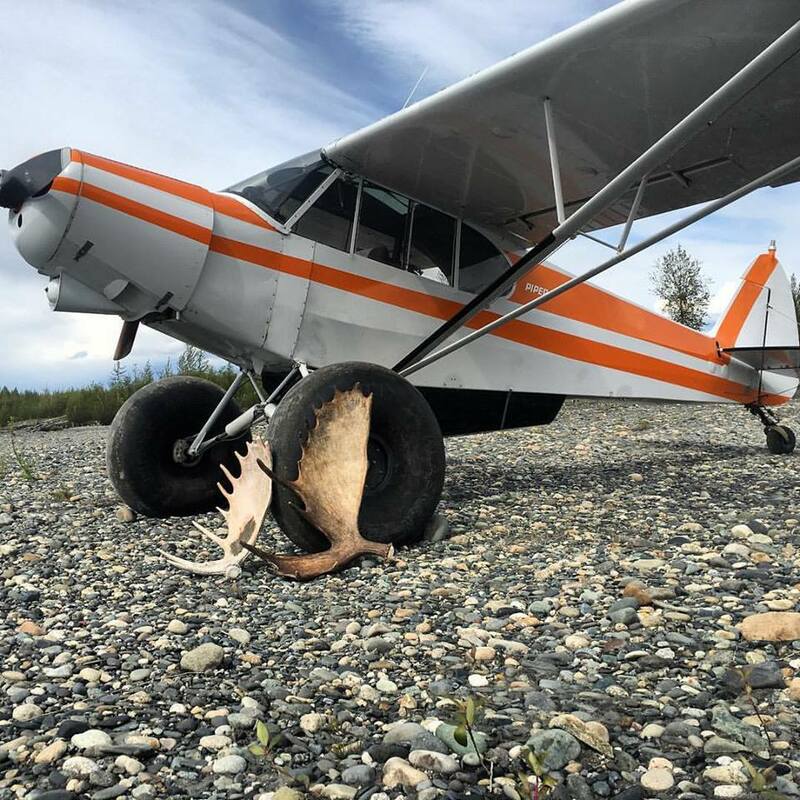 This moose died but the skull and antlers weren't destroyed by other animals. My son will try to sell this to an artist for a few hundred dollars. The perks of growing up in a family with airplanes. Here's the family Piper Super Cub...kind of like a flying VW bug. My son lands on the sides of river beds or small open areas and then hikes to the antler sheds he saw from the air. I have a quilt top loaded on the quilting frame that lends itself well to being a good canvas for working on my repertoire of "fillers." Deciding "what" to quilt is always the toughest part. I'm going with a clam shell variation in this space. I did a little practice on my plexiglass panel. It is cloudy and gloomy outside so I just might get some time to quilt today. Tomorrow is May's Breakfast Club. The theme is patriotic mini quilts. Last month I decided to start my own project separate from the group and lucky me...it fits into May's theme. I bought a set of Moda's Fire and Ice fat quarter batiks last year but didn't use them for the project I intended after I actually got them. Then I saw a log cabin chain pattern done in those fabrics. So last Breakfast Club I did all the preliminary cutting. I am ready to start sewing tomorrow. I feel like I am ahead of the game for once! Have to share the wonderful progress I made on my treadle machine refurbishing. The cabinet looks so wonderful. My family actually seems to like my little vignette display. The pilots in my life surprise me sometimes. My next step is to get the machine working. This was the year I finally made it to the annual premier Bush Flying event in Alaska, the Valdez Fly-In and Airshow. My son flew us to the event in my husband's Cessna 185. It was a gorgeous day for flying over mountains. A view of the Turnagain Arm through the increasing elevation as we made our way out of Anchorage. More snow-covered mountains...glaciers...and the water of Prince William Sound. In the above photo there is a tiny sight-seeing boat viewing a glacier edge jutting into the water. As we get closer to Valdez, there is more open water of Prince William Sound. Heading up the Valdez arm of Prince William Sound is the termination of the Trans-Alaska Pipeline which starts at Prudhoe Bay and traverses 800 miles to the Port of Valdez. We made a hairpin turn over the turquoise water from the hidden Valdez Glacier. Parked on the runway is our white with blue trim 185. We are surrounded by beautiful mountains. We rode a shuttle into the town. The gorgeous views continued. We ate dinner outside at the "Fat Mermaid," which had this spectacular view. It was a bit chilly but we had on our coats. We woke up to a layer of marine clouds covering the mountains and blocking the sun. The weather forecast was dropping temperatures with snow expected in the evening. This ancient looking aircraft, a C-46, is a major source of fuel for Bush communities in Alaska. It has been featured on Alaska reality television shows like, "Life Below Zero." The main part of the Fly-In is a bush pilot contest where planes vie for the shortest take-off and landing distances. By the time we got to the competitions it was windy and getting colder by the minute. We hung around as long as we could to watch two of my son's friends do their runs and then we loaded up our plane and skedaddled home. All the mountain passes were becoming shrouded in clouds so we had to take a longer route home. We had planned to stay a second night and leave Sunday morning but with snow in the forecast we could have been stuck for a few days. We had not brought our engine cover or flap covers to protect the plane from ice. We really didn't have room for our bags, four people and winter provisions for the plane! Darn it....winter weather was not in our plans! I wish there was a quilt retreat every month! I had a grand time. We stayed at the Pioneer Ridge B & B which started out as a dairy barn. It is a fantastic space for retreats and I hear the place is booked during the non-tourist season with other quilting groups and crafters like scrapbookers. You can click the name to visit their official website. I stayed two nights and three days. I tackled some boring projects that I have wanted to finish for seven years. Pillowcases and shams to match quilts I use regularly. I am thrilled they are done and I will no longer be shuffling those fabrics around my sewing room. Here are the first new pillowcases, two kings and two standards. And I got two shams pieced...the quilting part might take me a little while to finish. I had two blocks leftover from the original quilt...which by the way...was a Breakfast Club project the first year we started meeting, 2009. I used to finish the quilt tops and quilting before the next breakfast club. Not anymore! I've got an extensive "backlog" of quilt tops. I also made a set of pillowcases and shams to go with my winter quilt, Iditaquilt. A few years ago a batik with snow dogs was released and I decided it was the perfect fabric for companion pillowcases to my existing quilt. After being a good girl and mucking through the tedious projects I got to work piecing my "Bloom" quilt blocks together. I had to finish the final border at home but what a delightful design. I think some projects in the quilting queue are going to get bumped. A few more fun projects to share. Years ago I had my handyman build huge quilt frame to hang quilts in our master suite. I have finally got three quilts with hanging sleeves sewn into place. I adore the quilt below that started out as an online BOM. I took the 12 blocks and came up with my own setting. I've shown it before, "Sweet Peas in the Meadow." I'm so happy to see her everyday when I wake up. And I also just got another project done and delivered from my handyman a large console/cabinet that I will use for storing my quilts. I drew out the design and gave it to my handyman. He is amazing. He does metal fabrication work and he made the barn door railing from scratch. I LOVE IT! I am going to add a darker stain before I do the polyurethane coating. And one last silly picture. My first morning home from retreat. I woke up to both dogs on the bed after my husband got up to make coffee. Logan was actually laying on my legs. Kinley rarely gets on the bed when Logan is already in place. I missed them, too. Our club leader, Marcia, made a mystery from a pattern in this book. She encouraged the group to exchange colorful batiks, 2 1/2 x 5-inches for the three monthly meetings before our mystery in December. She also suggested we have 4 yards of a dark background fabric. On mystery day, she had us construct one block. Then she revealed her class sample of how the blocks would come together with one-inch sashing. We also got to see the original designer's pattern. The book has lots of great quilts and was a nice little Christmas present to ourselves. My favorite part of Breakfast Club is seeing the individual interpretations of the patterns we make. There was a lot of piecing to this particular project so it has taken several months for the finished and partially finished projects to start appearing at our Show and Tell sessions. Marge went small and made a runner. Joyce was one of the first to finish her piecing and get it quilted. She made hers smaller also, 42 blocks instead of the quilt pattern's 80 blocks. Megan went completely different with her color options. She chose a bubble gum pink background with turquoise blues and bright yellows. She dropped the sashing and created diagonal rows of stars where her blocks met. She also downsized the number of blocks. We have a second Joyce in the club and I think she is the only one making the 80 block size. She has all her blocks together and is planning to add borders. This quilt has a beautiful rosy tone to it. Jackie has her blocks sewn together. She downsized to 42 blocks. Borders are her next step too. Kathy downsized but also went with a completely different colorway. Hers is completely done and gorgeous. Erin was inspired by Megan's version without the sashing so that's how her blocks were put together. Her strips were cut from a set of state flower fabrics. This picture doesn't do it justice. It is always fun to see how Rona with change up a pattern. She used a multi-color background with a second dark sashing. My version is smaller also, 35 blocks. I made a piano key border with a "sashing" piece inserted to line up with the quilt's center. I love to use scrappy borders on scrappy quilt centers and piano keys is the option I most often use. My colors came from a "Splash," Bali pop and layer cake. My background is one of Hoffman's 1895 batiks, Blacklight. All my scraps were put together to make this little quilt I am calling, "Extra Credit." It is just shy of 40-inches square. I am going to write up a pattern for it. Maybe the ladies in Breakfast Club will save those little half square triangles from their future projects. I usually incorporate the scrappy HSTs into a border but this time I turned them into a quilt. I might just be on the cusp of becoming a small quilt lover. There are a few more Mystery quilt versions to be revealed at our Show and Tell sessions. We had lots of great projects for show and tell at Breakfast Club last week. April's official project was a pattern using panels. Rona had her's started before class. This wolf panel will be turned into a king-sized quilt. May's Breakfast Club will feature red, white and blue, patriotic projects. I think Rona has a head start on May's project, too. So hard to tell in this photo but the runner below is big and meant to lay across the bottom of a bed. Joyce's quilt shopping bag...great way to use those fun license plates so many quilt shops are featuring. Seams Like Home is our host for our Breakfast Club meetings. Don't miss the moose silhouette on the bottom right of Joyce's quilt from our last breakfast club gathering. Jackie just whipped this little Easter banner together. Love the contemporary design. And another project from Jackie, also from last month's Breakfast Club. Our projects featured the laser cut silhouettes from a Fairbanks quilt shop, Northern Threads. Here's the link to their website for their fantastic selection of laser cuts and patterns to feature them. Jackie was on a roll, a Breakfast Club project finished. "Horizon Charm," is the pattern from the Modern Quilts Unlimited magazine, Winter 2015 issue. And back from the quilter's, Jackie's "Fall Frolic," also a magazine project from Quilter's World, Autumn 2016.
and a gorgeous finish for her daughter's friend, "Diamond Drop." she was quilting this little Christmas quilt during our Breakfast Club. Marge made this adorable tote for her iron. I need this pattern. Finally, our official April class sample from Marcia. The pattern is, "Spotlight," from Mountain Peak Creations.